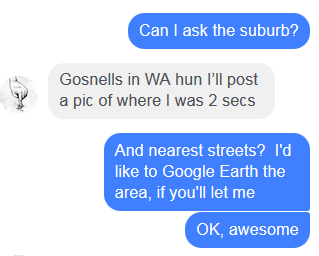 I PMed him, but he was about to go to bed, I guess, it was an hour after he'd posted, and about 2am here Brisbane time, and he actually replied. Now this is unfolding in real time, 3am Brissie time, which is about am Perth time. I will see how he feels tomorrow night, as will give him a call to see if I can glean anything else... in the meantime, what questions should I ask that may be helpful, do you think? I don't want to ask too many leading questions, but ones that do promote a response, so your help here would be appreciated. I will report back later, so thanks for your advice. And there are three reports from within 50km of my friend's sighting, right here on AYR, which I sent links to for him. 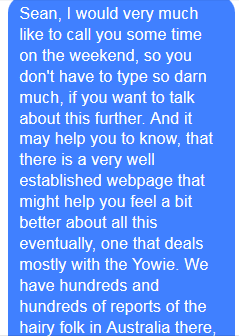 The whole experience sure does sound Yowie like. Perhaps fireflies or glow worm beetles but that does not account for the voice he either heard or felt. From the sounds of it , there wasn't anything there or "it" was invisible except for it's eye's ? All I can say is from what I've seen myself and from what I've heard and read is that the forest is a mysterious place . 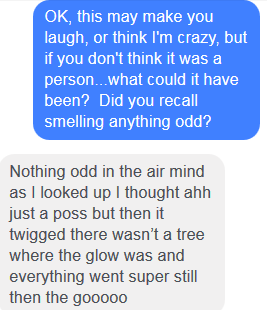 I would also say that there may be other beings (not sure if that's the correct word) or spirits or entities out there that people come across . It would be interesting to take an EMF meter and audio recorder there and record the results . If the being has warned the guy to "go" then he might hang around to make sure this happens . Hi Shazz. 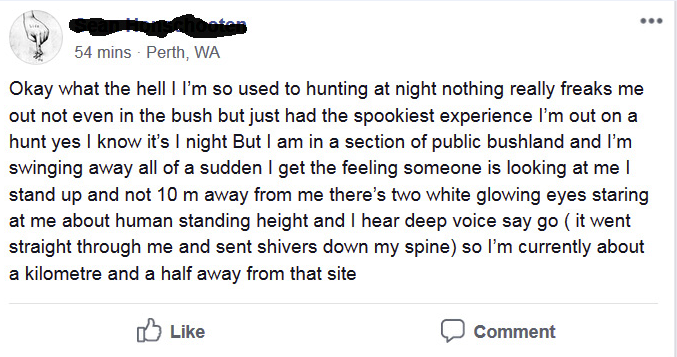 That sounds like a spirit or as Rusty says , one of the many other things in the bush. Could be yowie too i suppose with the feeling in the chest. I wonder is your freind of Irish decent? Maybe whatever it was picked up on this, hence the Irish " mindspeak"? I wonder also if your freind had any weird dreams last night after the experience...if they actually got any sleep after that!! It may be a stab in the dark, but it sounds more like a bush spirit than a yowie as hairy men don't communicate in English. That’s unless you believe the fanciful tales about Yurk. I certainly don’t! Thanks Shazz. Will look forward to further updates on this scary encounter. Hi, 2 big bright white eyes not changing with the torch, no body seen. Sounds exactly what i saw. Can i ask were the eyes really far apart from each other, or closer just like a human? Also were the bright white eyes round? 1) What was he hunting? 2) What weapon was he using to hunt? 3) What was he "swinging around?" 4) Was he by himself? 5) What was he thinking about, and his emotional state, immediately prior to the experience? 6) What was the yowie experience he had with his father, years before? 7) Has he ever had anything as strange as this happen, anywhere, before? What does he do with the bodies of the animals he kills? 9) Does he kill for sport or for food? 10) Does he disrespect the Bush in any way whatsoever, when he hunts - leaves rubbish behind, breaks and damages flora, urinates or defecates in streams or near water ways, creates a disturbance with his behaviour? 11) Was he doing anything he might feel guilty about? 12) Was he thinking of yowies or bigfoot beforehand for any reason whatsoever? 13) Had he consumed any liquor or medication beforehand? 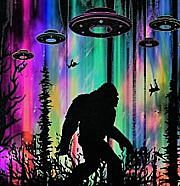 From what I've read, I could add his encounter to the yowie super abilities thread - glow in the dark eyes, super fear, and telepathy. 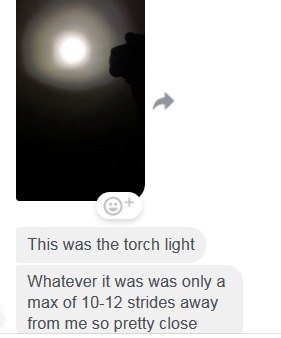 I'll also be in touch with another Witness tonight, who saw something in Qld last night. Didn't Shaz mention in her original post that this man was using a metal detector? That's what I assumed he was 'swinging around'. When he refers to hunting, I assume he means using a metal detector. Thank you, Simon! Once again, your comprehension comes to the fore, and you are correct. 'Hunting', in this instance is what we refer to a detecting session, as in, 'going for a hunt'. No firearms or intent to harm any creature were present. 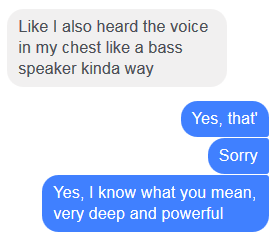 I'm going to address your comments, everyone, then update you all with what was revealed during the 90 minute phone conversation I had with my friend last night. As is almost always the case, speaking first hand rather than typing stuff on a message board revealed a lot more detail of his sighting, which should help clear up some of the initial points you mentioned, so stay tuned. First up, The Black Stump - these were not fireflies, my friend has never seen any in his decades of living and night detecting in the area. Also, they did not move, and there was no tree or bush for them to be sitting on, to be stationary during the sighting. 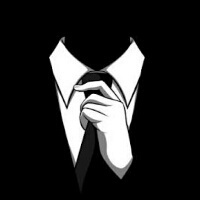 And you are correct when you say that did not explain the voice...and my friend DID go back last night, just before dusk, which took some doing, by his account. Rusty - Again, your experience seems close to the truth, according to my friend, and I'll elaborate on that in my update. "From the sounds of it , there wasn't anything there or "it" was invisible except for its eyes?" 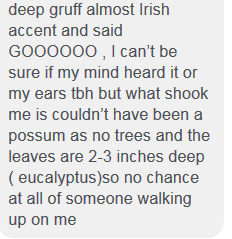 Yowiebait - No, he has no Irish in him, but his description of the sound this being made initially in his text is expanded on in the update below. According to him, he also got very little sleep last night, perhaps 3 hours. Said his mind kept replaying the same moments of his experience over and over again, and he couldn't stop it. (I had the same after a traumatic experience - it's the way the brain attempts to make sense of what happened, and it fades with time, but never completely goes away). Adventurer - Yep, nailed it. "Hi, 2 big bright white eyes not changing with the torch, no body seen. Sounds exactly what i saw. Can i ask were the eyes really far apart from each other, or closer just like a human? Also were the bright white eyes round?" Further details below, but it seems that way, so you and Rusty are on the money. "1) What was he hunting? Nothing. He was metal detecting, not 'hunting' in the traditional sense. No weapons on him. 2) What weapon was he using to hunt? A metal detector, as described. 3) What was he "swinging around?" A metal detector. 7) Has he ever had anything as strange as this happen, anywhere, before? Yes, both he and his father had a pretty convincing experience 20 years or so prior in the foothills of Perth while chopping wood. See update for more details. 10) Does he disrespect the Bush in any way whatsoever, when he hunts - leaves rubbish behind, breaks and damages flora, urinates or defecates in streams or near water ways, creates a disturbance with his behaviour? God, no. He's a fine example of a detectorist doing everything to minimise impact of his hobby on the environment. 11) Was he doing anything he might feel guilty about? No, not according to him. 12) Was he thinking of yowies or bigfoot beforehand for any reason whatsoever? No. 13) Had he consumed any liquor or medication beforehand?" No, he doesn't drink. Weather conditions: Very clear and very still, no wind whatsoever, no cloud cover. Lighting conditions: Very dark with almost zero vision (unassisted by head torch worn), as was surrounded by bush adjacent to a creek. So, 'S' had decided to go metal detecting ('hunting' in his words, a term often used in the hobby), and was armed with a metal Lesche metal detecting specific tool, essentially a digger, like a long handled trowel hanging from his belt, was wearing a head lamp type torch so his hands were free to detect and dig any target signals, and had his metal detector in his hand. For those not familiar with the hobby, you hold the detector in one hand, and sweep it ('swing it') from side to side in front of you, as close to the ground as possible, while slowly walking forward. He had been detecting for maybe half an hour and had just got a signal on the detector. He wasn't wearing headphones, just had the volume turned down low. He knelt to dig and retrieve the object from the ground, then got a strong feeling someone was watching him. Always being alert while night detecting is a given, as there are some who make sport of the hobby and the practitioners of same, and this can extend to harassment on some occasions, so 'S' was generally aware of his surroundings most of the time, but was distracted by having found a target and was digging for it. 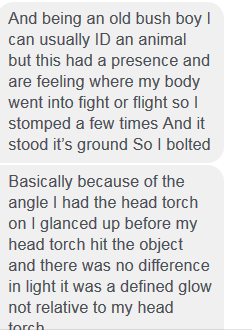 He looked around knowing the head torch would illuminate any persons nearby, as it was pretty powerful according to his initial message comments to me. Still kneeling, he noticed two, white, glowing points he simply called 'eyes', because that's what they were, or appeared to be to his logic. 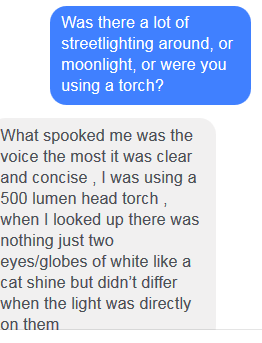 He noticed them even before his head torch focussed directly on the two 'eyes', if that makes sense, in that he says he saw the bright, glowing 'eyes' with his unassisted vision, even before he moved his head so his head torch lit them up, and they did not change brightness from when his sight had spotted them to when illuminated. As in, they were brightly glowing BEFORE his head torch hit them, with no noticeable change in the strength of the 'glow'. He immediately stood up from his kneeling position very quickly, not understanding what could have eyes like that. 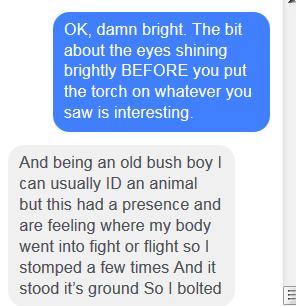 Now, he explained to me that he was born and raised in the Kimberley region, to a hard-as-nails father who taught his boys not to be afraid of the dark, and to know what animals were in the area, and how to identify them. 'S' related how his father would send the boys out to get water in a bucket from the pump about a kilometre away from their dwelling, at night, un-accompanied by an adult and by his accounts, he and his brother learned more about night creatures because they essentially were abroad when the boys performed their water-fetching chores on a regular basis for some years. They learned to identify owls, roos, cattle, wild camels and a number of other things including crocodiles (!) during these excursions, and 'S' was startled by the fact that he could not identify what he was seeing on the night of his experience. 'S' stated that he is about 5' 7" (about 165 cms) tall, and as soon as he got to his feet, he initially calculated that whatever it was he was looking at was about the same height. More on this perception/fact later. He described the eyes as being "white, like a fluorescent light" - no other colour. He stated that the eyes seemed wider apart than they would be if he was looking at a human being, perhaps an inch more wide between the eyes, which threw him even more. Dee, this is the part you will like, and which I found fascinating: 'S' then went on to describe the eyes as being "about the size of a ten cent piece, but not fully round (circular) - and as "round on the bottom of the eye, but oval on the top, as if there were eyelids partially occluding part of the actual eye. Probably not suprising giving he was looking directly at the owner of the eyes with a bright headlamp type torch, and I interpreted this visual description as perhaps indicating the creature was squinting slightly to cut the glare, something I've not seen described in any other AYR report, and which I found to be a detail of some worth. Did he see the eyes blink at all? He said no, just described that not-fully-round eye shape. Did he see any detail of anything like a face, body, of the creature in his head lamp torch's light? 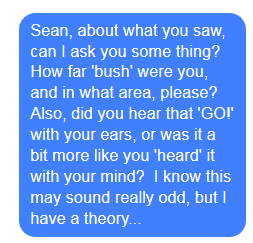 Again, he said no, but he did state that he was already freaking out, because a) he couldn't identify the eyes as belonging to any species of known animal he was familiar with and b) he did not notice any body or head details AT ALL. The way he described it, was as if the creature's body 'absorbed all light' rather than reflecting it off skin or hair or fur as you would see if you shone a light in the night at a cow or dog or 'roo. He also said it was as if the thing were "so matte black, that the light didn't reveal any texture whatsoever." He also stated there seemed to be no difference in the 'quality' of the blackness behind the creature, and where the creature's body should have been... which he didn't see, but he wasn't sure if it was because of him having had his eyes rivetted on the eyes of the creature more than anything else. 'S' told me though it felt like minutes, he calculated his sighting took perhaps only 3-5 seconds tops. So, he'd got the sense of being watched, looked up, seen the bright white eyes, jumped to his feet from a kneeling position, shone his head torch by moving his head a little, noticed no change in the eyes' glow when he did so, then the creature made a sound that 'S' had initially interpreted in his written message to me as sounding like an Irish-accented man saying "GO!" in a super powerful and forceful manner. If you wanted to imitate such a sound in your head, as I did, when he first told me on the phone, I thought the actual true pronunciation of the utterance 'S' had heard might actually sound more like "GOH!" I actually made the same sound to him on the phone and he said it sounded very much like that, but so very deep and gutteral (his words - gutteral, from the gut, deep bass, powerful), and that he got the impression of something 'huge' making the sound, and that it reminded him of the cartoon character 'The Hulk'. On probing further, he stated that it was as if he 'felt it in my body and head, not just with my ears', and I mentioned vibration of the air in the lungs from something huge (as you used to experience when an old diesel train would pass the train platform and you'd feel the sound shaking the air in your lungs - yes, I'm that old). 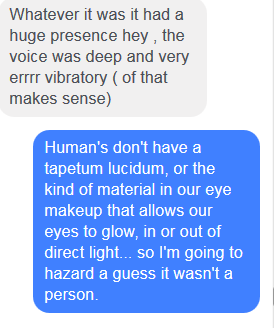 He said "That vibration of the lungs is EXACTLY how I'd describe it", and he had used the term 'vibratory' in his message text, as well as describing it as having a "huge presence", which you can see by scrolling back up. He told me that as soon as this creature made that massive sound, the adrenaline kicked in, and he went into 'fight or flight' mode. No creature he knew of could generate such a massive, powerful sound, and he's heard grunting feral pigs, 'roos, cattle, the lot, so he said. But, thinking he might be somehow mistaken, he fell back on behaviour he'd used in his younger years when confronted by a larger creature, which was to stomp one foot loudly and sort of 'square his shoulders' to look more intimidating. Bear in mind this fella has never read anything about yowies or the like, and their foot stomping to show irritation/dissapproval/it's time for you to leave, so I mentally gasped when he told me this. 'S' said deep down he was sure this wasn't any animal he knew, and immediately after doing this one-footed stomp, he turned tail and bolted, saying the 'flight' part of 'fight or flight' had taken over. He didn't make a conscious decision to do the stomp, or to high tail it out of there, and he told me "I'm old and fat now and yet last night, I think I ran faster than I've ever run before, my digger bouncing off the ground behind me as I bolted, so luckily it was secured to my belt by a cord, because no way would I have stopped to go back for it." He still had his detector in his hand, and said that he was so frightened, and that he couldn't get this image out of his head that "I couldn't get away fast enough, and this thing was right behind me and was going to get me." He made it to the car and took off, scared out of his mind at what he'd just experienced, and related that once he'd made it home, he couldn't get inside quickly enough, and slammed and locked both the screen and the wooden door, because he still couldn't shake the fear. In between his bolt to the car and arriving home, he posted the initial message you see at the top, on his Facebook page, 8 minutes (he said) after it happened, then he continued home, thinking he should stop and detect somewhere else so as not to waste the night, but his fear would not let him do so, and he headed for home. Talk about a Ben Hur story, but there's more. After "S' and I spoke on the phone, I asked him would he go back to the spot either at night or in daylight. 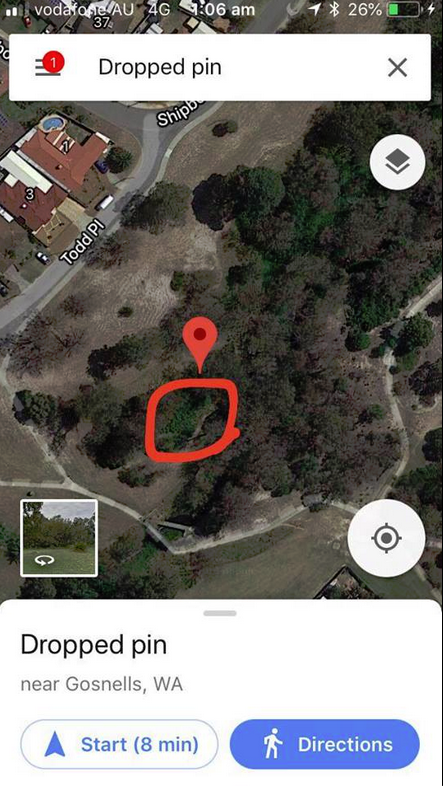 During his phone call, once he'd told me all he could, I asked him if there was any parkland or such nearby that may have had rubbish bins or some other kind of food source, that could have attracted a yowie. 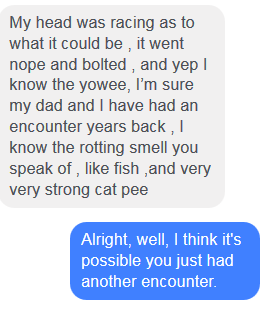 I'd used the term sparingly, so as not to fill his mind with imagery, but as it turned out, until last night, he hadn't even read about yowies or used the word in any really significant way SINCE HE AND HIS FATHER HAD EXPERIENCED SOMETHING 20 YEARS AGO. He never talked to anyone about it, apart from his Dad, and until now, me. But more on that later. As soon as I mentioned 'food source', 'S' told me that yes, there was. Mere metres from where he'd been detecting, was the site of an old orchard which was in production in the 1920's. This was mostly cleared ground now, but he stated that yes, there was a mature mandarin tree there, and that it had been dripping with ripe fruits and I went "AHA!". I told him I thought that perhaps that was what had attracted the creature, and then 'S' revealed something else. He said (more or less), "I reckon that thing was there the whole time I was detecting, watching me, until I got too close for comfort, and it roared at me as if to say 'Oi! I'm right here, you're too close, keep away!'" 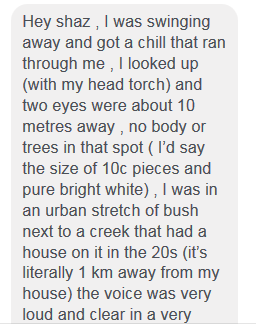 He then stated that the entire area near and under the eucalypt trees surrounding the creek had shed many of their leaves and there was a thick, crackly carpet of them maybe 10-15cm deep underfoot (remember he'd been digging detected targets, so would know this) that you couldn't walk on without being heard. I agreed with him, suggesting that the creature didn't move because it thought 'S' might hear its footsteps, so it stayed stock still until he would have hopefully passed and moved away. 'S' told me that "It would have been standing there for the whole time (almost half hour that I was there!" and I told him that these creatures were masters of not being detected and that I thought that was quite possible, given some of the reports I've read here. He revealed something else important too after going back - where he'd seen the glowing eyes, was not on a level the same as where he had been kneeling, and then standing. It dropped away to the creek behind, from where 'S' told me he 'reckoned that's where it came up'. To 'S's calculations, it was a fair bit lower than the level ground on which he'd been hunting, seen the creature, and stood up, thereby thinking the eyes were almost at his level, and that whatever it was was more or less the same height as him. 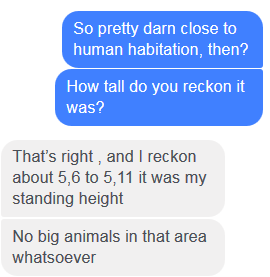 Now, seeing the topography, he re-calculated that he reckoned the creature to be "6 or 7 feet tall", and you could hear the dismay in his tone. So, to recap, 'S' has plucked up the courage to go back to the scene just before dusk, which fell quickly. He did more than take photos, he took video on his phone, and sent me two short ones via messenger. You could tell he was nervous, by his voice, and he stated he wasn't going any closer, as he just couldn't do it and in fact, really didn't want to do so. The videos were too dark to see much, but I had asked him to check for footprints, and to check out the mandarin tree, in case there were dropped fruits or something that might indicate something had fed on them. 'S's second video revealed him stating "I'm looking at the mandarin tree, and last night it was covered in fruit... now, there isn't a single one to be seen..."
To his credit, 'S' has agreed to go back in daylight (which he may do today, 29 April), and he'll probably call me this arvo, or will pass on what he has seen in messages. He will be looking for prints, hair, fruit remnants, any signs of anything that might show what he saw was 'real'. He's eliminated owls, possums and most creatures that would have their eyes at his heght. Interestingly, where he thinks the creature was standing... is not among the trees. Meaning that it was standing more or less in open space surrounded by trees when it vocalised. 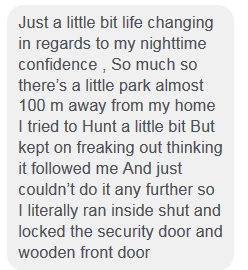 He is still a bit freaked out, and I told him that I didn't think the creature saw him as a threat at any time, and that I actually didn't think he was in any danger. I postulated that he'd just inconveniently been there when the creature/yowie had headed out for a feed of mandarins, and had more or less almost walked into the creature until it warned him with one grunted powerful "GUH!" to make him leave it in peace. Which he did, though his own peace has had a thorough shake-up as a result. Been up since 5 typing this out from my notes, off for breakfast and will relate the story about his and his father's previous experience in another post. Excellent write up Shazz, well done. You describing his encounter 'especially the strong feelings he got', resonated with me over my own sighting/encounter. My belief is that some can actually powerfully mind-speak or they emit such an aura as to be able to feel certain thoughts/projections. The whole story did sound very Yowish, goes to show they pop up in the most unlikely of places. --------- He described the eyes as being "white, like a fluorescent light" - no other colour. He stated that the eyes seemed wider apart than they would be if he was looking at a human being, perhaps an inch more wide between the eyes. --------- he did not notice any body or head details AT ALL. The way he described it, was as if the creature's body 'absorbed all light' rather than reflecting it off skin or hair or fur as you would see if you shone a light in the night at a cow or dog or 'roo. He also said it was as if the thing were "so matte black, that the light didn't reveal any texture whatsoever." 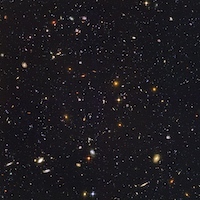 He also stated there seemed to be no difference in the 'quality' of the blackness behind the creature, and where the creature's body should have been... which he didn't see, but he wasn't sure if it was because of him having had his eyes rivetted on the eyes of the creature more than anything else. would have described my eyeshine experience exactly as stated above. The eyes i saw though were all round. Thanks for very detailed posts! You've painted a very clear picture. 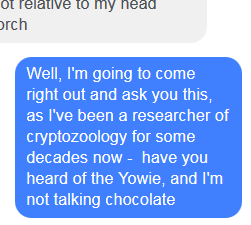 By all accounts, it would seem s had a metal detection just as he arrived upon a yowie going about its nocturnal business or as he encroached upon a yowie territory? Just a coincidence? The possibility the purpose of this being and the word "go", to stop s digging up and "finding" the metallic object s had started digging for? I'm sure s has found quite a few treasures in his time with this hobby, and said treasures often had previous human owners. Some with great sentimental value. He may have even found some expensive treasures. Maybe that's the fun of it? It would be interesting what he does with these treasures? I don't know why, but this story makes me think of the archaeologists in Egypt who stumbled across a tomb, and then read the curse associated with disturbing it. Your friend had his encounter moments before unearthing whatever he had detected. Yowies aren't the only beings people encounter with glowing eyes. While there are reports of yowies with glowing eyes of colors other than red, red is the most common reported color. White tells me your friend should be wary, and tread carefully, especially if his curiosity gets the better of him and he decides to unearth whatever he detected. Most people in his position would want to know, but he should really go with his gut feeling on this one. Perhaps he should look for footprints and other yowie evidence first...... and....whatever he unearths, he should be wary and cautious what actions he takes with it. I know this area very well. 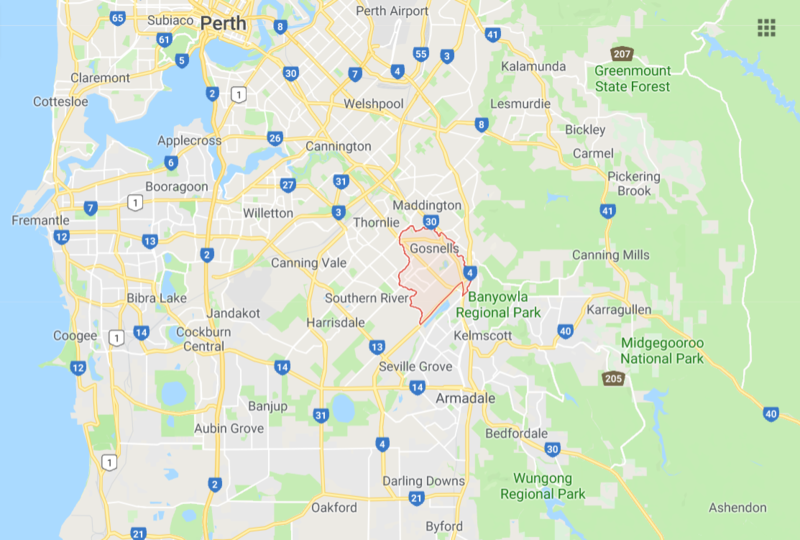 The southeastern suburbs of Perth, Gosnells, Kelmscott, Armadale, Bedfordale and further south to Byford and Mundijong ( where I lived for 13 years) are all positioned in the foothills of the Darling Ranges. 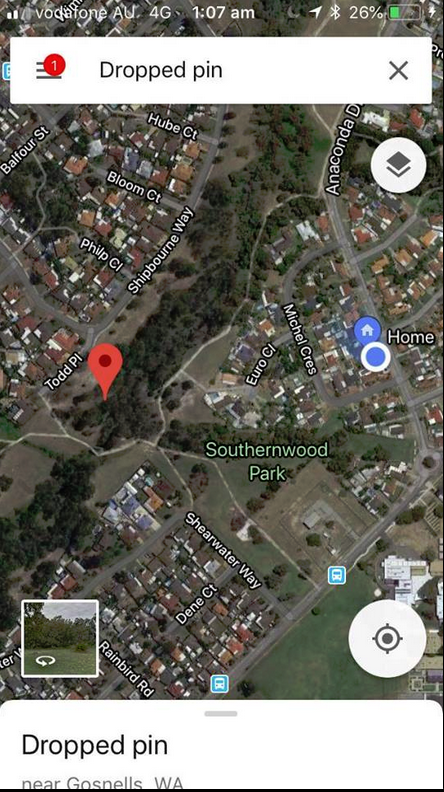 Many properties would have bushland adjacent to their backyards and I've thought about possible Yowie activity in this area. Back in the 90's loud cat roars were often heard in my area of Mundijong. The old logging town of Jarrahdale is located high up in the Darling Scarp surrounded by kilometres of tall timbered forest with gravel tracks meandering through the area and would be a great area for Yowie investigation. Rusty2, Yowie Bait and Dion have all mentioned the possibility of a Yowie or bush spirit or entity and I believe that to be the case. 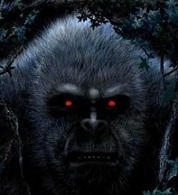 In my opinion no difference from a Yowie or bush spirit they are both supernatural entities. I know this is easier said than done particularly when you're on your own but this guy Sean should have challenged the entity and asked Who are you? he may very well have got an answer. 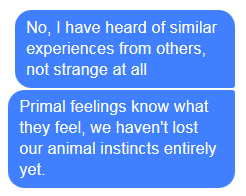 I think trying to communicate with these creatures and it obviously could talk is the only way we will progress with an understanding of what is going on. My thoughts exactly, Black. Their paths intersected, then they separated, no more, no less. With regard to what he may have found, it's likely to be any old metal stuff and the occasional coin that may have been present in that old orchard or by the creek, where he told me there once was an old dwelling that was part of the property. Again, and I emphasize this, what 'S' heard, he first took for a spoken word, as he thought it was a person, perhaps with an accent. Upon speaking to him, I believe it was more of a 'huff' of sound, not an English word 'Go' as he first thought. I doubt it was any human being speaking English, one word or otherwise. It does not surprise me that I am perceiving your words in the same way many other non-detectorist have done, whereby there is an assumption that the aim of the hobby is to find 'treasure', and by that, i mean something of worth, such as lost jewellery or gold sovereigns etc. The reality of detecting is in most instances, so unlike this assumption (though some people actively target beaches for lost jewellery, for profit, or return to the owners), in that what we consider 'treasure' would make the most mercenary of finders shake their heads. An old penny, or an ex-military insignia, even a musket ball, badge, lead soldier, toy car, actual car part, axe heads, tools, horseshoes or in fact almost anything that is old and significant in that it belonged to someone from days long gone means much more than the non-existent in most cases, face value of the find. It's the fact it's historical, or from pioneering days that is the lustre these detectorists seek. Occasionally yes, one may find an old brooch, earring, pendant, ring, but equally, a detectorist like 'S' would attempt to find an owner if possible, and if living, or have rellies that can be traced from that old home site or shed. There are other detectorists who would just as eagerly pocket such a find, and sell it for gold value, but I can't judge them, as I don't know their circumstances, and I know of dozens of folks who detect places where people frequently go, with the aim of picking up spendable modern currency or perhaps jewellery that can be sold to eke out a pension. I can understand that it's hard to knock back selling something that might net you $200 when you have bills and no food in the house, so to each their own. Personally, I have only ever kept one ring and it was the first one I found when I was 16, 37 years ago. All others have been reunited with their owners or handed in to the Police. Even that one ring was handed in, and the Police returned it to me after nobody had claimed it within 3 months, and after I placed an ad in the paper. I have no idea what 'S' does with his finds, valuable (if any) or not. I don't intend to seem sensitive about this issue or my interpretation of your words, so please if I have it totally wrong, disregard what I have said. And while I can't speak for the Hairy Folk, or whoever this visitor was, I imagine they may not have understood what they were seeing either, but didn't approve of what may have been perceived as a human digging for food in a Yowie territory. Stranger things have happened. I am also fairly certain 'S' will never detect there again, and I will pass on all folks have said here, to him for his consideration. Am loving everyone's thoughts on this, and will write up the story of 'S's first encounter when I can. It's like this: in summer, it's just too damn hot to be out in the sun for more than half an hour, and dangerous to do so. Not only that, but as I've mentioned, some folks 'pick on' metal detectorists for kicks, others can get all upset at what they see as 'scavenging' or (my most hated) 'making a profit from others' misfortune' i.e., loss of money, jewellery, etc. as if all detectorists are unscrupulous thieves, just waiting to find something that's been lost that they can keep or spend. I have been laughed at, insulted, had snooty people tell me "I didn't know you were that hard up" and so on. It's part people's perceptions and prejudices, depending on what their experience of metal detectorists may be, or what they've read or heard from others, and part sour grapes that the detectorist might be *GASP! * finding FREE MONEY!!!!!!! when they, who don't detect, aren't able to do so. As a result, some detectorists prefer night time hunting/detecting, when there are less people to harrass them. It's also a lot quieter, not as much traffic, and you can hear the signals more clearly. It's also lovely being out there with a cool breeze, and finding stuff is only part of the enjoyment of just being out in the open, getting some gentle exercise and enjoying what you do. The thrill of the chase is a powerful motivator, and if you find something cool, you literally want to keep going until the detector's batteries wear down, or yours does. You'll have to wait for that, sorry. I am at my deceased father's house this weekend, and I am up to my neck in phoning all the people in his phone number book, as well as writing elegies and service notes, in between communing with my family to make the necessary arrangements. 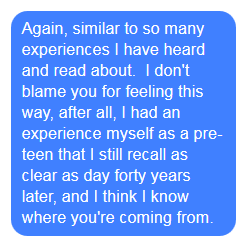 The only reason I followed up on my friend's story is that I felt I owed it to the group, and didn't wish to delay my response until after Dad's funeral on Wednesday. So patience is called for, and I'll get to it after then. Thanks for understanding. 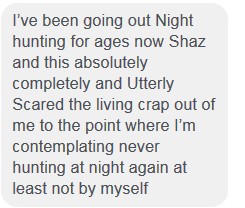 Yes same here Shazz. Thanks! I get the metal detector thing. Reminds me i need to upgrade mine. Trying to locate some coins i buried over 40 years ago. Seemed like a good idea at the time! Sorry to hear about your Father, Shaz. My condolences. It is Autumn. The daytime temps would only reach the high 20's and possibly low 30's for Perth. Not too hot at all for a few hours of your hobby fun. Night time detecting is also performed by persons detecting illegally on private property. In the goldfields, serious night detectors use expensive night vision and are just thieves. They would be shot at or run out of town if it was daytime. Could it be that S has been warned to stay off this place, and the Human land owner has set him up to scare him off? Or could other detecting persons want to scare him off the profitable ground? older and cheaper metal detectors do not work very goodl on hot ground , newer and more expensive pulse induction detectors work good on hot ground. When Shazz was referring to "hot" I was of the assumption that she was commenting on the daily temperatures. In fact she was, as she mentioned summer and being hot in the sun. When discussing "hot ground" in metal detecting, one is referring to the high mineralisation in the ground and how this mineralisation can make it hard to pick up weak treasure signals because of the minerals interference with the detector signals. Sorry, I am not seeing your point re "hot ground" relating to this topic. I had to resist posting a link to the dreaded "Man's Not Hot" video, then. Either way, I think the idea that someone might have deliberately targeted this man in order to frighten him is one that needs to be considered seriously.